Friday's US payrolls report, which to a large extent represents a latent effect of the US dollar rally over the past couple of years, was dismal. On a relative basis, hiring Americans has become more expensive for global firms. An elevated level of uncertainty, driven in part by risks associated with the US monetary policy as well as the presidential elections, has not helped. Let's look at some trends in the labor markets. 1. 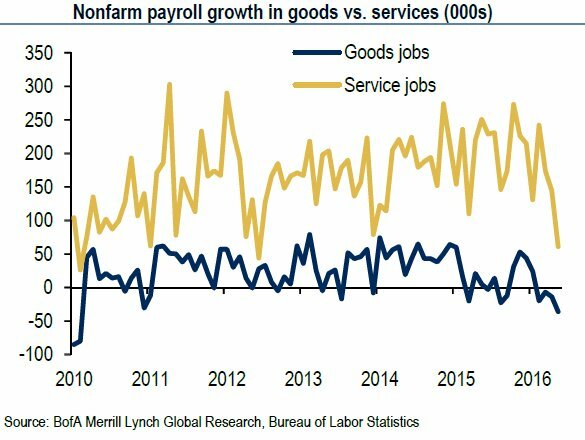 The job market's weakness has now spread to the services sector. 2. 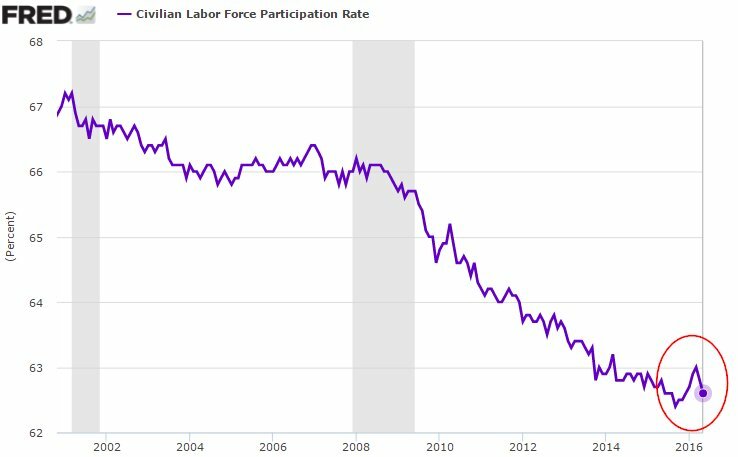 After a strong showing over a previous couple of months, US labor force participation has turned lower. 3. 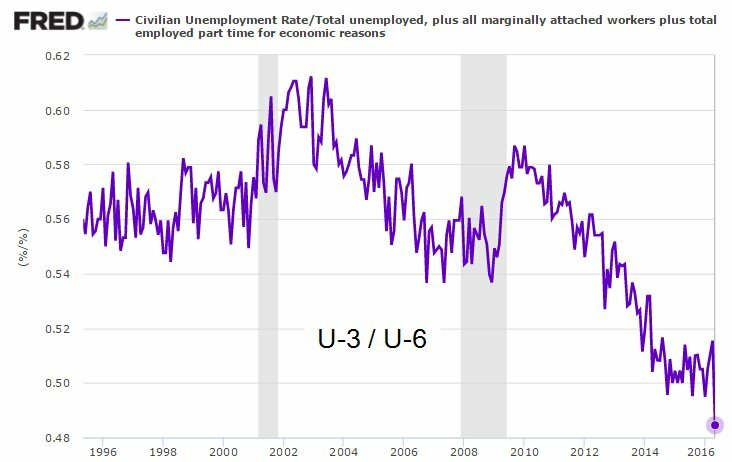 Even as the headline unemployment rate (U-3) declined to lows not seen since 2007, a broader measure of unemployment, which includes marginally attached workers plus those employed part-time for economic reasons (U-6), has stalled. Below is the ratio of the headline jobless rate to the broad (U-6) unemployment over the past couple of decades. While fewer people are filing for unemployment benefits, the health of the broader labor market has significant room for improvement. 4. 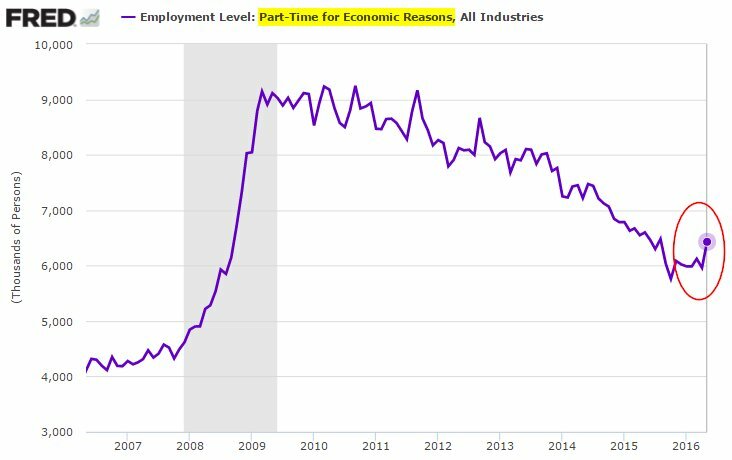 Related to the above, here is part-time employment for "economic reasons". 5. 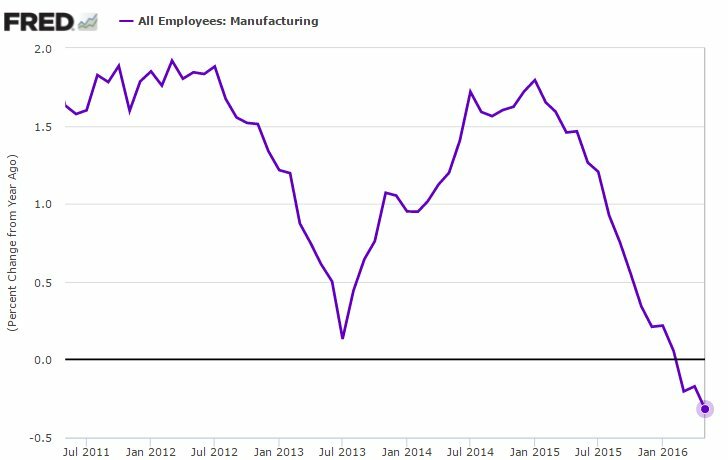 US manufacturing jobs growth has worsened again on a year-over-year basis. 6. 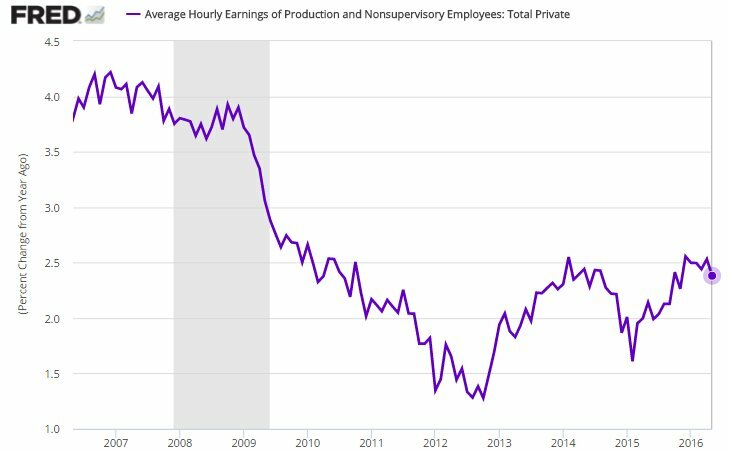 Wage growth is back below 2.5% (YoY). Unless the non-demographic component of labor force participation begins to climb again, it's difficult to see a significant jump in hourly earnings growth. It is worth pointing out, however, that given slow inflation, real wage growth in the US is reasonable relative to a number of other developed economies. 7. The next chart shows the average weekly hours worked by US employees on a year-over-year basis. Even with a positive hourly wage growth (above), declining hours could mean less cash in households' pockets. 8. 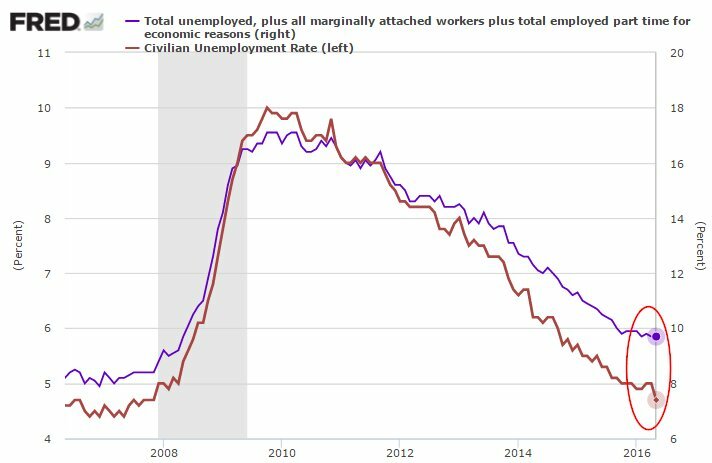 For what it's worth, the headline unemployment rate is now below the 'Natural Rate of Unemployment". According to classical economic theory, inflation should begin to rise at this point. But given some of the labor market challenges shown above, price increases - outside the recent increase in energy and agricultural commodities - should remain benign. 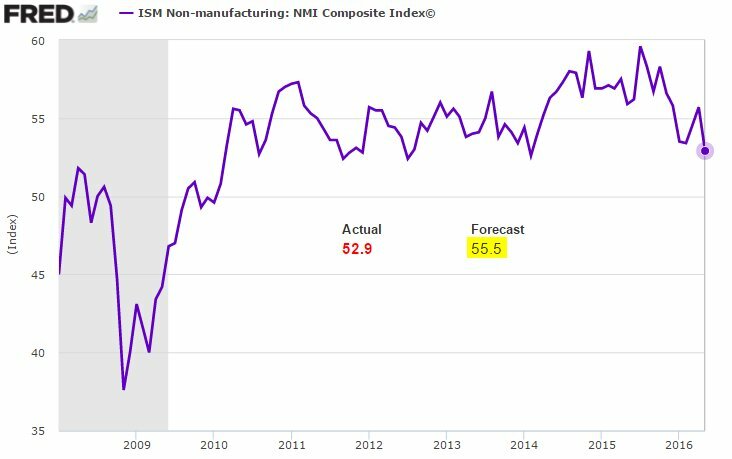 Separately, the ISM Services PMI weakened in May. This provides more evidence that the soft patch in the US economy is not limited to manufacturing and energy. 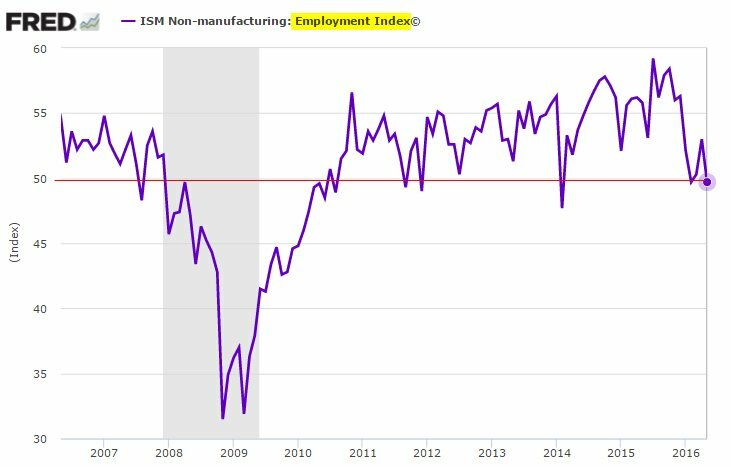 The ISM Non-manufacturing Employment Index is consistent with Friday's poor payrolls report (above). 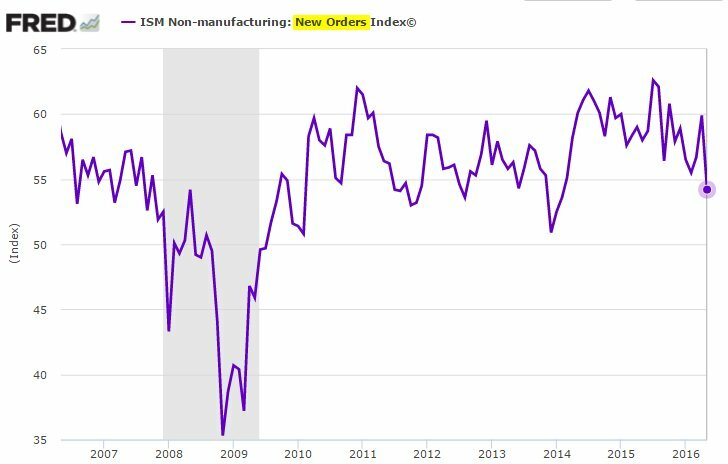 The ISM services sector new orders index is also shown. Is this consistent with the projected 2.5%-3.0% US GDP growth in Q2? 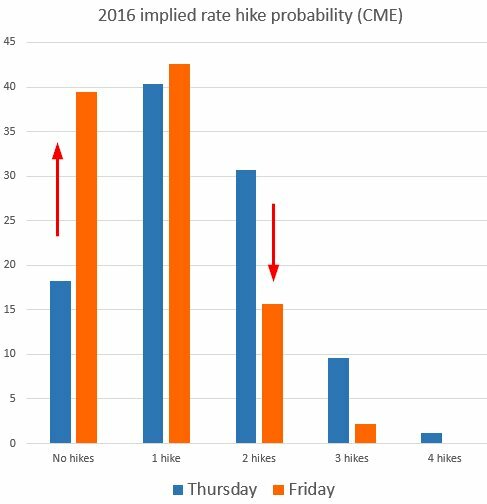 Here is what Friday's economic reports did to the implied rate hike expectations in 2016. 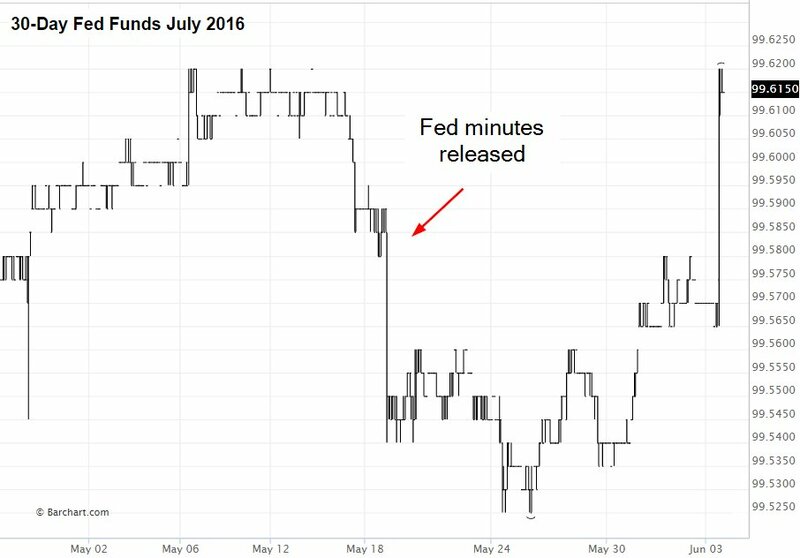 Another weak jobs report will send the probability of "no hikes" to 100%.